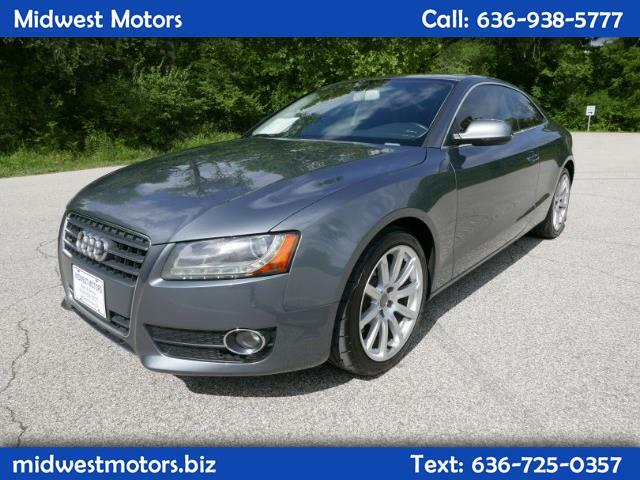 This 2012 Audi A5 2.0T comes equipped with "Quattro" all wheel drive, which means you're getting great handling, performance, and traction in any weather. The "quattro" all wheel drive system was invented by Audi for competition on world rally racing circuits - and they dominated the track! Our 2012 Audi A5 continues this tradition of elegant performance, and has been pampered with just 78,316 miles, and is very clean inside and out. Leather interior heightens the quality and craftsmanship Audi is well known for. Manual transmission - feel the road under your hands! Tons of technology, from power everything (including seats), to a well equipped in dash radio with all the goodies you're after. SUNROOF! HEATED SEATS! STEERING WHEEL CONTROLS! Come test drive this one! We accept trades - financing options available for all buyers! Call (636) 938-5777 or visit us online at https://www.midwestmotors.biz ! Midwest Motors in Eureka MO is West County's LARGEST Pre-Owned Full service dealership. Our secret? We treat people the way they want to be treated. Whether you're coming from St. Louis, West County, St. Charles, or Illinois, our sales, finance, and service departments are ready to help you become a lifelong customer! We look forward to serving you!